Thanksgiving is coming up, and as everyone knows we often refer to this day of giving thanks as “Turkey Day.” This year before “Turkey Day,” gather your students and talk about turkeys! Ask children if they have ever seen a turkey. Where was it? What did it look like? Talk about what turkeys look like and where they live and the difference between wild and domestic turkeys. 1) Provide children with turkey feathers or other feathers to explore with a magnifier. 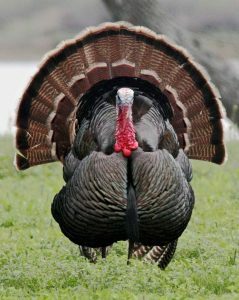 2) Listen to wild turkey gobbles and clucks at All About Birds: Wild Turkeys. 3) Play “Follow the Turkey Leader.” Baby Turkeys, called chicks or poults, follow the adult turkeys to stay safe and to learn. Take turns having the kids be the adult turkey, the “leader,” and pretend to be a flock of turkeys looking for food in the woods. This is a great outside game but can be played in the classroom. 4) To really get into the game, let the children make turkey hats for to wear! Visit Family Fun: Turkey Hat for instructions. 5) For snack time, make Candy Pretzel Turkey Bites, try turkey meat, compare light and dark meat, or eat like a turkey and make dried fruit and nut mix.